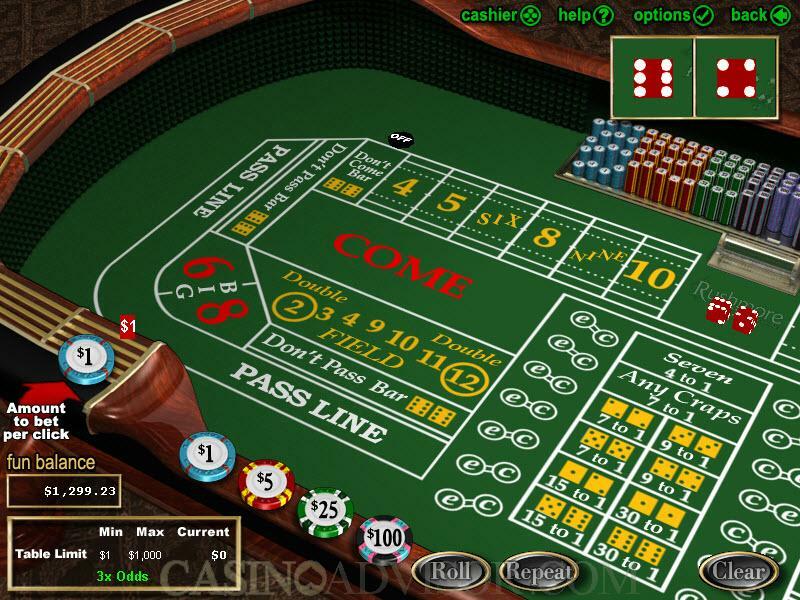 Craps is perhaps the most complex of the casino games for two reasons. It has many different types of bets. And many of the bets are resolved over a number of rolls of the dice. The player’s balance is shown at the bottom left corner and the available chip denominations just on the right of that. A minimum bet of 1 is required. Most bets have a maximum bet of 100, except for some special bets. Not all bets are allowed to be placed before the first roll. The player first creates a chip stack by clicking on the required chips. Then when the player clicks on any allowed betting area the entire stack is bet. The player then has to keep rolling the dice till the bet is resolved. The player is at a liberty to place new allowed bets while the earlier bets remain unresolved. Craps is a game played with two dice in which the objective is to predict which number will be rolled. Craps is played in rounds. The first roll of the dice in a round is called the come out roll. Depending on the wager placed and the number rolled, the wager can win or lose automatically on the come out roll. If it does not then the number that was rolled becomes the Point. The Point plays a crucial roll subsequently. Most of the bets can be placed before a come out roll. These are Pass Line, Don’t Pass, Field, Buy, Place, Lay, Craps, Seven and Yo Eleven. The bets that can be placed after a Point is established are Pass Odds, Come, Don’t Come. Come Odds, Big 6 and Big 8. Most of these bets are decided in a single roll but some of the more popular bets, called contract bets, are decided over multiple rolls. The bets on the table are automatically removed from the table as soon as they are decided. Once all the bets are cleared a fresh round will begin. The player can click on the Repeat button to place the set of wagers that existed before the last roll or he can place the bets afresh as indicated earlier. The highlight of Real Time Gaming Craps is the animated simulation of the live casino craps game. The dice are rolled across the table. Hit the wall on the opposite end and come to rest. Hitting the wall is an important feature in live casino craps because that ensures the randomness of the outcome. The rolling of the dice is accompanied by realistic sounds on the audio. Other acts that replicate live casino proceedings and add realism to the online game are the movement of chips across the table when bets are decided and the movement of the marker to indicate the Point. Interested in reading more detailed information about Realtime Gaming Craps? If so Click Here for more details.